YANGON—Lower House lawmaker U Bo Bo Oo of Yangon’s Sanchaung Township on Jan. 9 called Yangon Mayor U Maung Maung Soe a “windbag” in a social media post complaining about public sanitation services in his constituency. His post caused a storm on social media. The Irrawaddy’s Thazin Hlaing interviewed the lawmaker about his criticism of Yangon municipality. 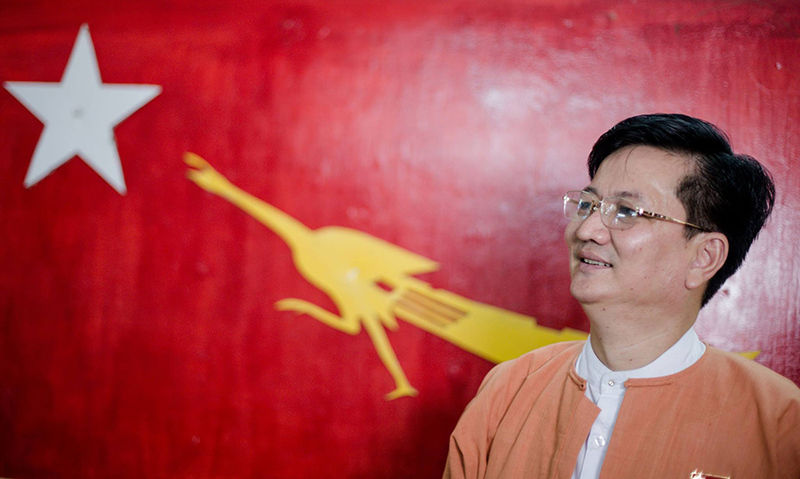 Why did you call the Yangon mayor a “windbag” on social media? I called him that because I don’t think he’s carrying out his duties. What do you mean by his duties? As he is the mayor, anything related to the development of the city is his duty. He has ultimate responsibility. He must be able to manage [the city] properly. But I’ve found that he has neglected that duty. Can you give some examples of things he failed to do in your township? For example, the sewerage system was not functioning properly, and [human waste] was spilling into the drains. [The municipality] didn’t handle it, though I filed a complaint. It has also failed to handle the problem of stray dogs. In a letter, I asked [the regional government] to handle those problems, and it sent me a telling me how it would do so. But it hasn’t been able to handle the problems on the ground. So, local residents face the problem of stray dogs daily. Furthermore, the sidewalks [in Sanchaung] are occupied by vendors, forcing people to walk in the street. It’s unsafe. As the 2018 YCDC [Yangon City Development Committee] Law has come into effect, I want [the municipality] to apply it. But I see no [implementation] on the ground. Far from implementing it, the situation gets worse. If the new YCDC Law does not take effect, that’s a threat to the rule of law. That wouldn’t be good for the country or the people. Why did the municipality fail to respond to your complaints? There is a problem with management. There is a mechanism in place for different levels of management to handle these issues. [The mayor] must be able to handle it effectively. He doesn’t need to go around town looking into ditches. I’d be happy if he just did his job. You are a lawmaker of the National League for Democracy (NLD). U Maung Maung Soe was also appointed by the NLD. Some say you should have spoken with him privately, rather than posting about him on social media. What do you say to that? The media—regardless of which type—are meant to serve as bridges between the people and the authorities. This must be accepted. There have been strong responses to your criticism of the mayor from both from the public and within the party. This is normal. The NLD is fully democratic, internally. It is normal for party members to argue with each other at party meetings. This is the essence of democracy. The NLD has the strongest democratic values in Myanmar. Every executive of the NLD is elected. We are the only party that exercises democracy in Myanmar. So, [such criticism] is normal to me, as we implement democracy on the ground. Has the party leadership or the government spoken to you about your criticism? Our party allows internal criticism. There are frank discussions and criticism within the party. These are the [party’s] values. I read in a news report that [NLD spokesperson] Monywa U Aung Shin speculated that I would be punished by the party. His speculation undermines the party’s image. His speculation amounts to underestimating the party. The party places a very high value on democracy. The fact that he doesn’t know this means he has lost touch with the party. You compared the mayors of Mandalay and Yangon. What differences have you noticed as a lawmaker? Though I am a lawmaker, let me speak colloquially: They are as different as fragrance and feces. What kind of mayor do you want for Yangon? A mayor who works like the Mandalay mayor. What needs to be done to get such mayor? I mean, will it be done by the people or by the government? For the people’s part, there will be municipal elections on March 31. Six people will be elected to the YCDC, and one will be the vice mayor. It seems that we will have to place our hopes in him or her. It would be good if the current mayor changed his mind and worked [for the city]. What is your response to those who say the mayor has no authority? That is shifting the blame. He shifts blame to his superiors to cover up his inactivity. I don’t believe he has no authority. People had high hopes when the new municipal law was enacted, as it carries jail sentences for violators. How is it being implemented on the ground? People have a good opinion of the law. They anticipate its enforcement. So, I want to urge the YCDC to implement it boldly. Then, people will follow. What is the main obstacle to implementing it? The mayor’s failure to do his job.